Searching - Pony-Go-Round PINK MUSICAL PONY "All the Pretty Little Ponies"
Home→SEARCHING→Searching – Pony-Go-Round PINK MUSICAL PONY "All the Pretty Little Ponies"
Searching – Pony-Go-Round PINK MUSICAL PONY "All the Pretty Little Ponies"
I wanted to thank you. A year ago, May, my son had left his Carter’s Best Friends Comfort Blanket, which he called “Doggie”. It was a blue satin trim blanket with a dog head/arms in the center. You helped me find one! We were able to purchase it (for a pretty penny because they didn’t make them anymore) and have it sent. It was just like the one that was left at the hotel. So, he took to it right away. I can’t say thanks enough!!! I have a blue musical pony by Pony-Go-Round. It plays, “All the Pretty Little Ponies”. It is a 2001 North American Bear Company product(NABCO). The little pony’s head will turn when the music is played. I purchased it in 2003 when I was pregnant with my son. He moved in the womb when I held it close to me. I did right purchasing a blue color even though I didn’t know if I was having a boy or girl. Now, we have just had a little girl. 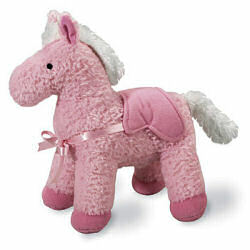 I have searched everywhere to get her the pink version of this pony. However, I have been told that it is not made anymore. Do you or anyone out there know where I can get one of these?